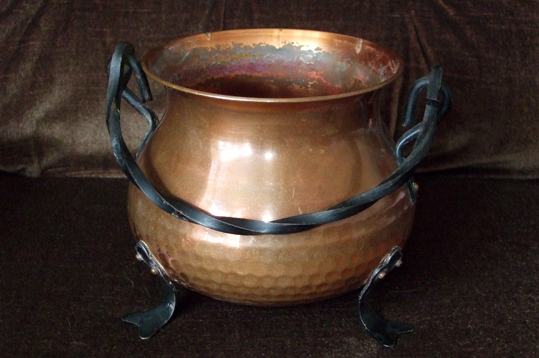 I bought this lovely copper cauldron when I was at The Nameless Arte symposium on traditional witchcraft on Saturday. I love it. It is the perfect size and light enough to easily carry around. Back in March I blogged about the cauldrons I already own - eight real cauldrons and nine if you count a plastic Halloween bucket - but I didn't have one of a medium size. I had two large ones and a lot of tiny ones that are only really useful as tea-light holders. I'd been looking for another and the one I've just bought is the perfect size. I'll be taking it along to my scrying workshop at Treadwell's next Sunday as one of the things people can use, filled with water, to divine the answer to their questions.